First up was tonight's special guest – a late addition to the bill which had led to much speculation. The mystery act was in fact Player Piano, also known as Jeremy Radway, who has been treading the boards with Fence colleagues for a good few years now, always promising immediate progress the album which his debut EP whetted appetites for back in 2009. Tonight, it's just Radway with his guitar and thus we don't get to hear too much from that big, brassy EP of soulful croons – but we do get an insight into the record he's spent years working on. Radway has been a father for almost a year, and claims his domestic duties have left him wholly out of practice and unprepared for the evening. There's certainly a shambolic air to proceedings, but in the hands of a showman like him it becomes part of the fun. His deep growl of an Indiana accent in which he mutters during the between song pauses is nothing like the cracked, soaring leap of his vocals when he cuts loose and lets the simply strummed tunes turn into heartfelt, swelling soul-pop gems. There's a moment when his lack of preparation results in him having to play back an MP3 of one of his forthcoming tunes to fix the lyrics in his mind. A lesser performer could have been fazed, but the laconic Radway takes it in his sometimes oddly Lou Reed like stride. By the end of his short set he'd got the audience largely on side and responding warmly to his quiet take on things. He's claimed many times before that the album is almost here, and on the strength of tonight when it arrives it's got a fair chance of being quite a record. There is a moment when it looks like Randolph's Leap aren't going to fit on the stage. For their landmark first ever gig outside Scotland, the entire band has assembled here. From the joyously brassy, opening blare of “Hermit” from their forthcoming Fence EP, it's clear that they intend to make an impression on the locals. Tonight we see a no-nonsense Adam Ross leading the band through an amazingly tight set list – written on the back of a discarded paper plate – with less of his inter-song jokes – which I surprisingly miss despite his famously dubious quality control - and more tunes packed in. And of course we still get his lyrics – dripping with wit, built around off-kilter and ill-advised rhymes but always managing to tug just the right heartstrings somehow. With a prodigious work rate, the Leap are here to promote not only the forthcoming EP but also a recent home-recorded affair for Peenko Records, “As Fast As A Man”. Hearing these brittle, wonderfully vulnerable solo pieces reworked by the full band is quite an experience, and with the addition of violin, trumpet and trombone filling them out into minor epics. One of the best things about seeing the full-band incarnation of Randolph's Leap is the sense of abject fun which exudes from the stage – there are lots of bands I love to see perform, but few I actually feel like I want to join on stage. Sadly, the Leap's long-suffering manager has forbidden them to add any more musicians to their growing troupe for now – so my triangle solo will have to wait. Just like the last couple of shows I've seen, they close with “Crisps”. How this song has mutated from a strange little casio-backed strum into the blarting, singalong romp which is played tonight is probably worth a whole article in itself. As it is, it provides a fittingly memorable exit for the band tonight. It's easy to be glib and dismissive if you're a Londoner and can see new bands every night of the week – but lets hope Randolph's Leap caught a few ears and stick in a few memories tonight. 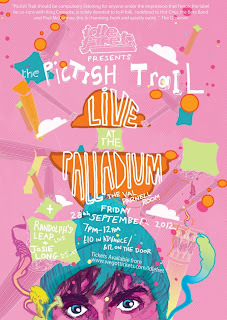 It's fair to say that The Pictish Trail has his work cut out following the triumphant Randolph's Leap set. But, he's nothing if not a showman and on this, his birthday, he has a crowd of loyal Fence followers eating out of his hand. Opening alone on the stage with his guitar, his aching regret-laced falsetto has the audience spellbound. He could probably have got away with this for the entire set, but instead he introduces his band – a collection of musical luminaries culled from the might of Scotland's underground with whom he's been working fairly regularly for a while now. The result is a remarkably tightly honed indie-rock sound which produces some engaging moments of blissed-out noise, but occasionally drowns Lynch's vocal talents entirely. 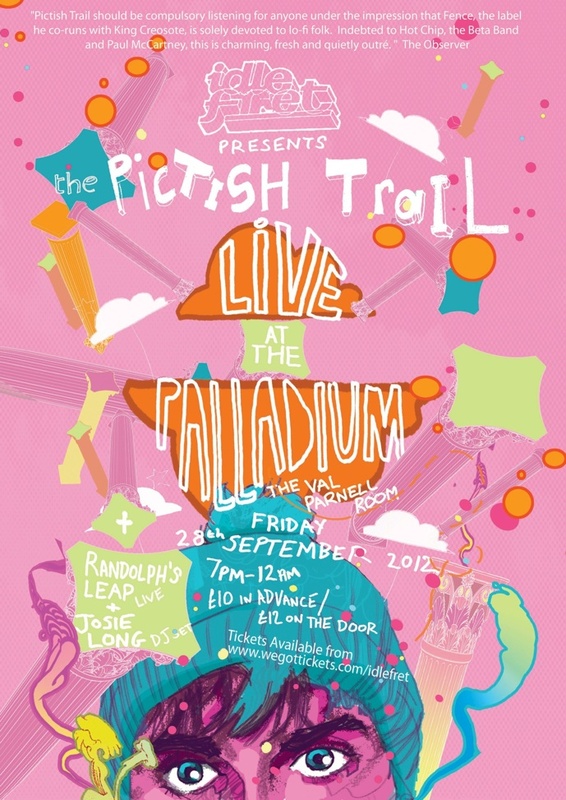 However, the presence of the band allows The Pictish Trail to explore work from his recent EP including the woozily narcotic “Michael Rocket” and a chugging, glam-rock take on “Of Course You Exist” released so far only as a download accompanying a sweatshirt. The highlight for me though, as it has been previously, was a searing, vitriol-drenched take on “Ribbon”. Turned from a delicately picked ballad on record into a spitting, howling burst of punk rock, it sets heads bobbing in a manner which this venue has probably not seen before. The band are clearly loving every moment of this, and the end sections of songs become extended workouts, with Bart Eagleowl emulating by turns Jimmy Page and Mark Knopfler while Lynch fiddles with electronics and introduces warped, warbling noises into the mix. Invoking the spirit of variety theatre which haunts the building, Lynch calls for audience participation during “Not To Be” and gets a raucous, roof-raising response, before closing with the mighty “Winter Home Disco”. Deceptively summery and warm, the gently insistent beats and shimmer of guitars provokes spontaneous dancing in the room. Its a reminder just how fine this song is, and despite the bands early exertions there is nothing brutal or hamfisted in their delicate treatment, while Lynch is spurred to new heights. All too soon it's over, and we're left with Josie Long spinning Justin Timberlake on the decks without even a hint of irony, while a large chunk of Randolph's Leap hit the dancefloor. It was one of those kind of nights, where improbable things happen and where seeing acts you've seen repeatedly succeed on their home turf decide to tear up the opposition's pitch. opportunity to buy you a drink and say thank you.